How to remove an Apple ID from iPhone We the Apple iPhone users often face an issue when our iPhone asks us to enter someone else password and it is pretty normal. So how to get rid of this issue? Well, the only solution to get rid of this issue is to remove the Apple ID from the iPhone. Or if you have purchased a second-hand iPhone and now you want to remove the apple id and enter yours. Well, these are the common issue that most of the Apple iPhone or any other Apple product user faces. Well before we really go ahead let’s know what an Apple ID actually is? An Apple ID is an email address that the Apple devices use to identify you and keep your activity records. The Apple ID setup process basically begins while setting up the iPhone for the first time and the iPhone remembers your ID. Also in future, you do not have to enter your Apple ID again. However, sometimes you have to enter your Apple ID password due to some security reasons. So it is important to remember the password of the Apple ID. Often the iPhone keeps displaying a popup that asks you to enter your password and it gets quite irritating. The common of reasons behind this issue is that someone else had entered their Apple ID on your device or you have purchased a second hand Apple iPhone. Hence whenever you try to download an app from the Apple App Store, your iPhone assumes to use the previous Apple ID instead of yours and it ends up asking you to enter the password of that Apple ID. Whatever the reason is, whenever this issue occurs it is, of course, a mind-numbing problem. As you can not download any apps or any other kinds of stuff from the Apple App Store. So how to get rid of this? At the very first open the App Store App on your iPhone. Now look for the Features option inside the App Store, once found tap on it. Now scroll down to the bottom of the featured page. Over here you will get to see the Apple ID. After that, you have to tap on Sign In button in order to log in. Now enter your Apple ID and password and you are good to go. Once you are done, then your Apple iPhone will not ask for any password. However, you may still need the old Apple ID and Password in order to download or update apps. So what to do if you don’t have the password?. Well if you are wondering “how to remove an apple id from iPhone without password”. The truth is that you can not remove the Apple ID without the password. In such cases, you have to contact the iPhone seller if you own a second-hand iPhone. Else if someone else had added their account on your iPhone then you have to ask them for the password. 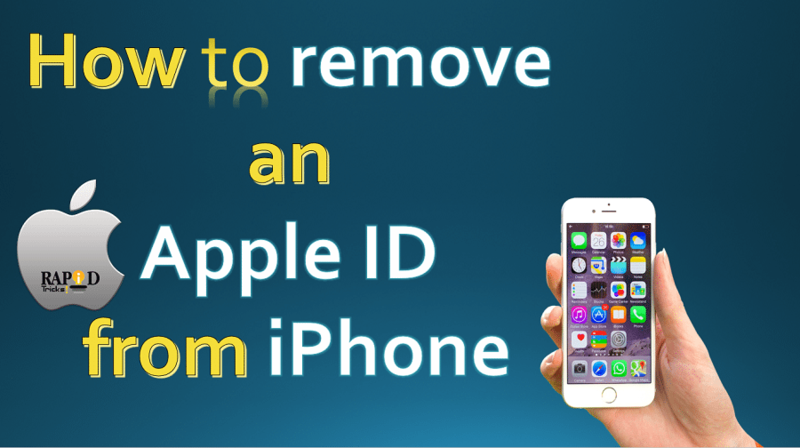 If you are wondering how to remove apple id from stolen iPhone?. Then we are here to help you out. It is quite normal for an iPhone to get stolen. However, to remove the Apple ID from the stolen iPhone you will need another iPhone. If you do not own any other iPhone then you can borrow from someone. So at the very first get an iPhone. Now on that iPhone, you have to launch the “Find My Device” application. Now sign up using your Apple ID. Then you have to tap into Actions. Now you will get a button that says “Erase iPhone” so tap on that. Now again you will get the “Erase iPhone” button but on a new page. So tap on the button. Enter the Apple ID details again. Then Click on Remove from the account and you are good to go. This step also can be used in order to remove someone else’s Apple ID from your device. So you can consider this step as well. First of all turn of your iPhone. Now open iTunes on your computer. If you do not have the iTunes application installed on your computer. Then consider downloading the application. Plug the iPhone into your computer. Now press the home button on your iPhone and press it down until you do not get to see the Apple Logo. Once the Apple logo pops up you have to restore it from the iTunes and you are good to go. So these are the 3 working methods on How to remove an Apple ID from iPhone whether you have lost your iPhone or forgot the password of your Apple ID. I have explained all the 3 working methods to remove Apple ID for iPhone users. I hope this guide on how to remove an Apple Id from iPhone helped you and you learned something new today. Let me know in the comments section below if you have any questions regarding the tutorial guide. I’d be more than happy to hear your query. If you liked the article please do share it with other tech savvy people around you.